Club Penguin Cheats by Mimo777 Club Penguin Cheats by Mimo777: Orange Puffle Discovered In Club Penguin Video! Awesome! Finally REAL proof of an orange puffle! 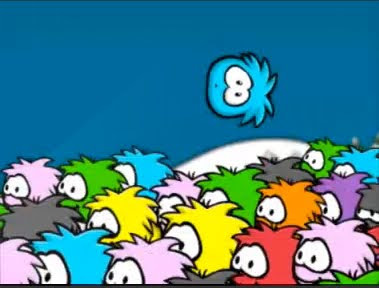 Remember when Club Penguin made a puffle video? If not, you can check it out here. We found the white puffle in the video last year. OH MY GOD!!! That's soo cool! There's no doubt we're having it soon. oh my gosh!!!!!!!!!!!!!!! sooooo awesome! I CAN NOT WAIT UNTIL THE PARTY!!!!!!!!!!!! I know!! It is so exciting!! Now that we have real proof.. the orange puffle has to come out!! If it doesn't.. I am e-mailing CP..
mimo u posted that last year! during the PUFFLE PARTY! I'm willing to bet dollars to doughnuts that that's either an edit, or a mistake made by Club P.
omg!thats like soo cool,now i want the puffle party to be here TODAY!! Mimo,there is a speaker pin in the pet shop! can someone help me? !where do you find the puffle video on cp?i told my friend and they dont beleive me!i took it on my camera,(bb9087)plz plz help! Mimo!!! In the forest there's a box!! MYSTERIOUS!! OMG!!!!!!! I can't wait! Srsly! WOO HOO!!! Orange Puffle time!!! Mine too!Not just color but DRINK!My favorite drink is Sunkist orange! Mimo, I have no idea how you always find these things...but they are AMAZING! P.S. I'm changing my name back to Doopliss 677. LOL! That would be funny! Well if there is no orange puffle then that would mean that Club Penguin lied. Because they showed it in the Puffle Party Video. I haven't seen the blog, is that video on the CP blog? Where is that vid from! Help please! Kewlz Mimo!!! I watched the video and saw it!!! I'll take that bet ;) Lets hope your wrong. Hope131 I prayed for your grandpa. Is he doing better? well, at least that explains the orange "R" in "PUFFLE PARTY." i bet we r gonna get a brown puffle next year because it's the T! Ya thats awesome! By the way when are you going to announce the cave haiku winners? But youll never pick me... or will you? No, probably not. Maybe we will, we'll just have to wait and see. good, then there's room for my silver puffle parody. Yeah, Mimo, where are those lucky wieners?! Oh, don't be so negative! You will probably do great! Keep a positive attitude like I always do and anything can happen! Really. Last time this happened, it was with the white puffle, and it became real! be ready! What time in the video is it at? Hahaha!First i tough that too but... how much you bet? I want my prize because the orange puffles eat all the plants from the box dimension!Plants are green soooooo.....I wait our prize! Hi, i went on clubpenguing and was thinking that there may be 3 new puffles coming soon and now i came on here and noticed your post about the oraqnge puffle =D the reason i said 3 was because i thought you should know that the colours puffle party is written in are all the colours of the puffles including 3 extras =D orange, brown and dark pink =D what d'you think?? Yea that might be a toy they use. you might be right thats a posibilty. I beat co jus use the same videos with the white puffle before but made it orange. :|. i randomly paused the vid and was so suprised when i saw the orange puffle! Yeahh! Mimo! We need the haiku winners. Bob head. Mimo will find the winners and tell us really soon. He may even pick you. Who knows. Gudluck! OMG orange is my favorite color and im soooo excited but also mimo look at puffle party sign there is a orange AND brown letter!!!!!!yay!!! !now we can PROBALY have a orange and a brown puffle maybe later the brown puffle will start apearing around the island!